Raise your hand if mashed potatoes are your favorite part of Thanksgiving dinner (or any dinner). Yep, we figured it wasn’t just us. Really, there’s nothing better than a heaping mountain of creamy, buttery potatoes, preferably with a gravy volcano erupting on top. 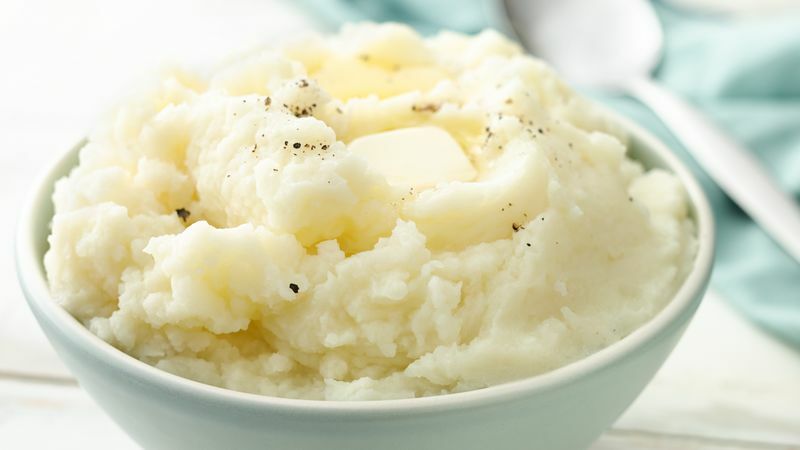 Here’s how you can whip up homemade mashed potatoes with just a handful of pantry ingredients. As far as the best potatoes for mashing go, reliable russets are the traditional pick and result in the smoothest consistency. Go for the gold (Yukon Gold, that is) if you like a little more texture in your mashers. Sweet potatoes make great mashed potatoes as well, but red potatoes are better for boiling, pan-frying or roasting. Our no-fuss, no-fail Easy Homemade Mashed Potatoes are made with just five ingredients. Peel your potatoes and chop them into quarters. Place peeled, chopped potatoes in a large saucepan, adding enough water to cover. Add ¾ teaspoon salt, and bring to a boil. Step 3: Reduce heat to medium-low, cover loosely and boil gently for 15-20 minutes, or until potatoes are tender enough to be poked through with no resistance. Step 4: Drain well and return potatoes to saucepan. Shake saucepan gently over low heat for 1-2 minutes to evaporate any excess moisture. Step 5: Mash potatoes with potato masher until no lumps remain. Add butter, pepper and remaining ¼ teaspoon salt. Continue mashing your potatoes, gradually adding enough warmed milk to make potatoes smooth and creamy. So, let’s talk about texture. Do you like your potatoes creamy and velvety? Or more rustic and lumpy? Achieving one or the other is all about the starchy chemistry of potatoes. The starches are very sensitive, so you want to mess with them as little as possible, which is challenging when the whole point is to mash things up. The trick is to be efficient the first time around so you don’t over-mash and end up with a sticky mashed potato paste. Not appetizing. For extra-smooth potatoes, use a potato ricer to break down the potatoes. A ricer is kind of like a garlic press for potatoes. It gently breaks down the starches. For smooth, classic mashed potatoes, use a flat grate-style, hand-held masher. This is what we used in our recipe. For a more rustic texture, opt to keep the potato skins on, use any hand-held masher until you get to your desired lumpy to creamy ratio. What type of potato masher is best? As with a lot of kitchen tools, it’s all about your personal taste. Some people swear by the traditional squiggly wire kind of masher because it’s easy to clean. We often opt for the flat, round grate style of masher because it’s great for smooth and creamy potatoes. Potato ricers will truly make your life lump free, but they aren’t as practical for regular use because they are difficult to clean and can only rice small amounts at a time. Avoid electric mixers, food processors or food mills. They are simply too harsh on those starches and you risk winding up with gooey, sad mashed potatoes. Even though our classic recipe is a winner, there are so many add-ins and substitutions to try with mashed potatoes. This is one of those times when it is totally okay (and really fun!) to mess with a good thing. For a tangier flavor, substitute buttermilk for milk or add ¼ sour cream along with the milk. For a richer flavor, substitute cream or half and half for the milk. For garlic mashed potatoes, cook 6 cloves of peeled garlic with the potatoes. Mash garlic along with the potatoes. Even better, roast the garlic first and then mix it in as you’re mashing. (Roasted garlic is milder, so you can add even double the amount.) Our Garlic-Parmesan Mashed Potatoes are incredible. For cheesy mashed potatoes, stir in 1 cup (4 oz) of your favorite shredded cheese. We love cheddar or Parmesan. For totally loaded mashed potatoes, try these Cheddar, Bacon and Onion Mashed Potatoes that don’t skimp on toppings. For herbed mashed potatoes, stir in 2 tablespoons chopped of fresh chives or ½ teaspoon of your favorite fresh chopped herb, such as thyme, rosemary or basil, or combine all three for a super flavorful dish. For low-carb mashed fauxtatoes, try our Cheesy Mashed Cauliflower. For a hands-off approach, you can make the absolute easiest mashed potatoes with just two ingredients in the slow cooker. Leftover mashed potatoes can be stored in the fridge in an airtight container for up to 3-5 days. Mashed potatoes also freeze fairly well and will keep for up to a year in the freezer. To freeze and reheat: Scoop individual portions of mashed potatoes onto a baking sheet lined with parchment. Freeze uncovered and then put the frozen portions into a freezer bag. To reheat straight from the freezer (or after thawing for a day or two in the fridge), place potato portions in a large pot on the stove on medium to low heat, stirring occasionally. When heated through, add a little extra butter, sour cream or seasoning, if desired. Make potatoes your pal. Here’s all the other things you can do with spuds.